Robin Hood (2018) Review | Nerd Much? Can we as a society finally admit that Robin Hood isn’t that compelling? The character is rarely ever taken in an interesting direction, which causes most interpretations to feel too familiar and bland. 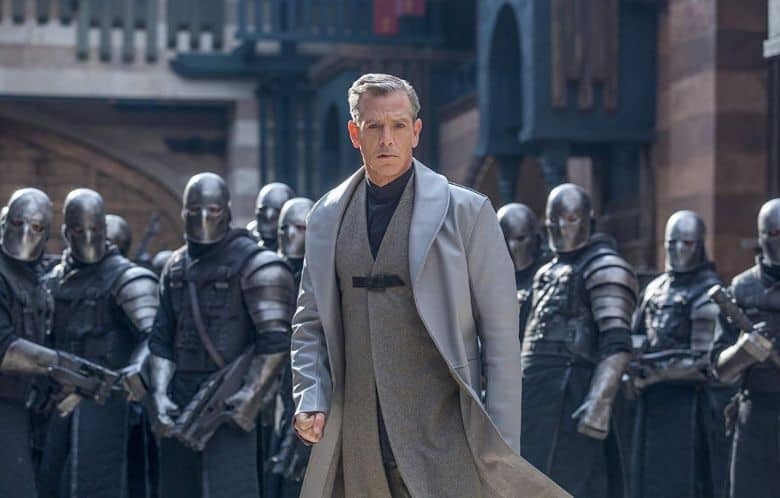 Enter director Otto Bathurst’s Robin Hood, a film aiming to add a bit of a twist to the character. 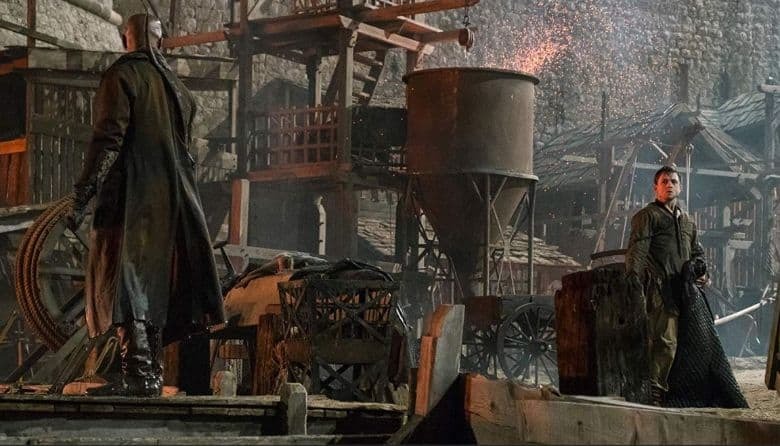 Yet, thanks to a poor script, odd stylization, and boring action scenes, Robin Hood ends up missing almost every shot. Set in Nottingham, the story revolves around Robin of Loxley (Taron Egerton) who is a spoiled noble that gets drafted into the Crusades. After a dishonorable discharge, he comes home and discovers that not only was his land seized, but his former flame Marian (Eve Hewson) in the arms of another man. Disgusted with how the Sheriff of Nottingham (Ben Mendelsohn) has been leading the city, Robin teams up with former adversary turned mentor Little John (Jamie Foxx) to take him down. Despite the familiarity of the plot, Robin Hood does try to throw in a few twists and surprises. The biggest is Robin mainly starts stealing from the Sheriff just to impress Marian. It’s an intriguing angle to take the character and acts as a simple, but effective character arc. However, we never see Robin act selfish or narcissistic to the other characters, making these moments feel forced and unnatural. There’s never a scene with John or Friar Tuck (Tim Minchin) that would suggest he’s still immature and cannot think of the greater good. It’s also doesn’t help that his conflict with Marian being in the arms of another man ends in a spectacularly dumb fashion. This is emblematic of the biggest problems plaguing Robin Hood. Clever ideas weighed down by a terrible script that either contradicts or is too afraid to fully commit to a concept. While John’s motivations and redesign are a success, you can tell the film is straining to make Tuck and Marian relevant. Both of them are given a subplot about working against the Sheriff that appears out of nowhere and is immediately forgotten two scenes later. I’m all for giving both of the characters something to do, but Robin Hood doesn’t bother setting up their plan. We just hear about it the night before as if the audience is supposed to already know what their goal is. Mendelsohn’s Sheriff is the worst of the bunch. I have no problem with him being evil for the sake of being evil, but Bathurst tries to shoehorn in an elaborate conspiracy involving the church. It’s really silly, especially since Robin Hood only vaguely explains its plan to the viewer and just expects them to go along with it. Their elaborate plan ends up creating far more questions than answers, which is quite frustrating. This is only enhanced at the ending of Robin Hood, which doesn’t even resolve the big conspiracy. You can tell the studio wants to make a sequel, because the film ends were about 99% of the other Robin Hood movies begin. Thankfully the cast gives generally solid performances across the board. 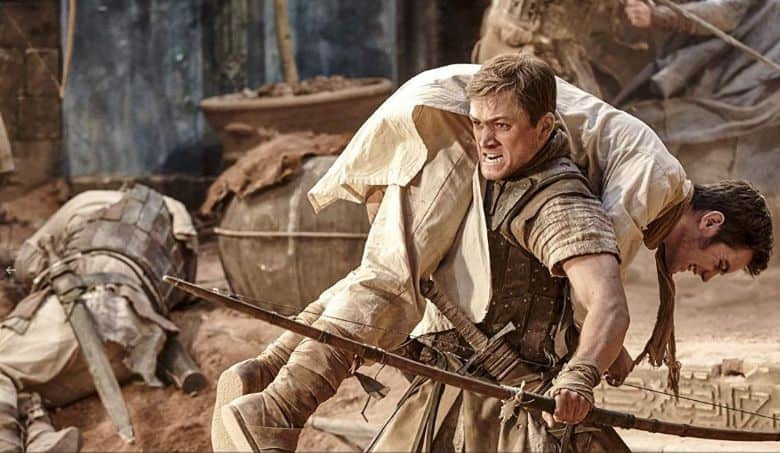 Egerton still has natural charisma and is undoubtedly the next big action star. Foxx’s version of Little John is fun, even when he hams up the dialogue and action scenes. Hewson is a confident Marian, even if the film has zero idea of what to do with her. Mendelsohn is basically playing the same evil role he’s always cast in. The only actor who flops is Jamie Doran who plays Marian’s new love interest. Doran couldn’t look more bored here and he lacks any chemistry with the rest of the cast. Yet, the worst part of Robin Hood is its weird stylistic choices for the actions scenes. Throughout the film, bows and crossbows are basically guns. From the way they hold them to the slow-mo bow on bow firefights, no one in this city has apparently ever heard of a sword. This does craft some interesting action scenes, but a few fall flat on their face. One involving Robin during the Crusades is particularly dumb as it tries to evoke modern day firefights. The problem is this sense of style is absent in the cinematography and editing. The bland and straightforward camera shots make 90% of the film look awkward. There’s no rhythm or flow to the film, it’s just “paint by numbers” camera work. This makes one scene – a lavish masquerade party – feel so out of place. Suddenly Robin Hood jolts with energy only to have its unique visual flourish snuffed out. Unlike last year’s King Arthur: Legend of the Sword which was at somewhat consistent with its direction, Robin Hood lacks the energy it desperately needs to keep the plot moving. What we’re left with is a boring, unappealing film that is only kept afloat by its terrific cast. I wanted to like Robin Hood, but movie’s inability to commit to unique ideas made it a complete slog to finish. Maybe its time for Robin to hang up his tights because these movies about him are only getting worse.